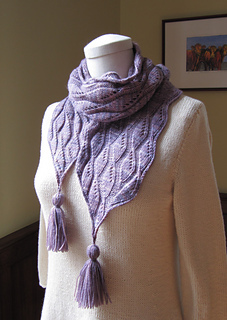 in Wave and Eyelet pattern, blocked. 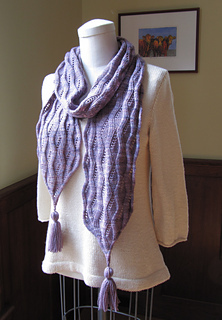 -Finished Size: 5 3/4” wide and 73” long (excluding tassels). 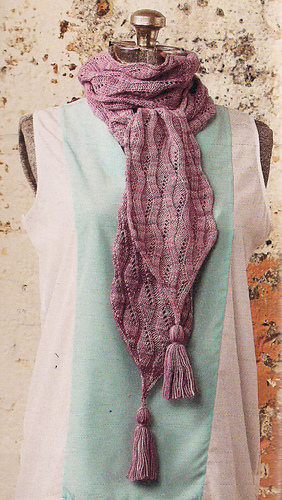 -Yarn: Manos del Uruguay Fino (70% extrafine merino, 30% silk; 490 yd 450 m/3 1/2 oz 100 g): #401 corsage, 1 skein. -Needles: Size 4 (3.5 mm). Adjust needle size if necessary to obtain the correct gauge. 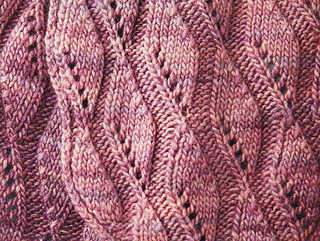 -Gauge: 32 sts and 36 rows = 4” in Wave and Eyelet patt, blocked. 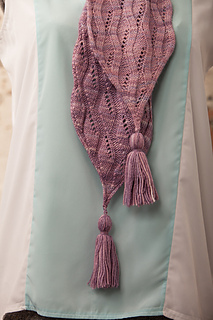 This reversible tapered scarf features wavy stockinette columns on one side, columns of diamonds on the other, and tassels on the ends. 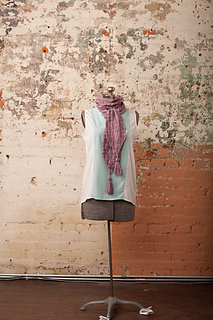 For a blog post from the designer about the design process for this scarf, see here.